Welcome to the Contest rules page! When participating in the contest you help millions of aquarists around the world to get information about nature freshwater biotopes, to get inspired by the beauty of biotope aquaria and to make people pay attention to ecological problems. Together we go the very important way! October 1st to 31st. We accept entries and necessary information about aquaria from participants. November 1st to 4th. We process data and publish information on our website. It is the last possibility to correct mistakes the organizers can point out. November 5th to 15th. The members of the jury will evaluate the entries according to the criteria. November 16th to 19th. We process evaluations and comments by the members of the jury. November 20th. The results of the contest will be published. Anyone can participate in the contest, regardless of citizenship, nationality and place of residence. The contest rules are the same for everyone. 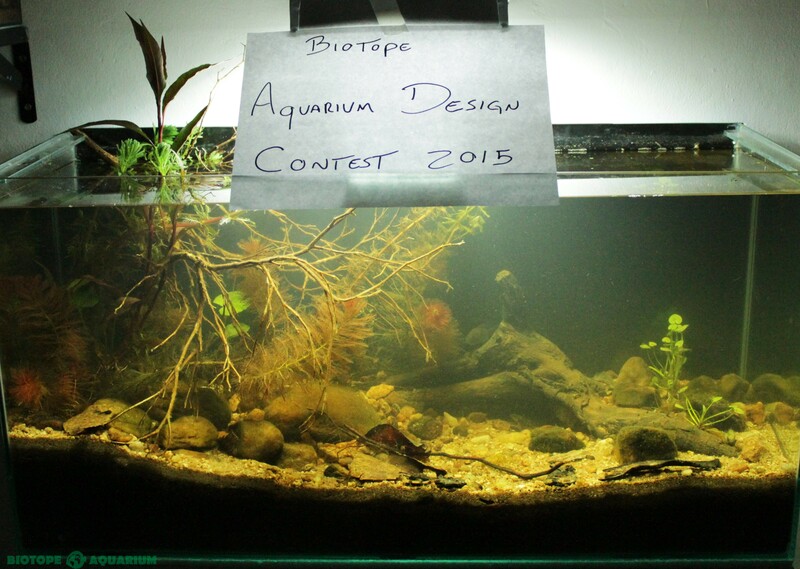 Each participant has the opportunity to submit up to five biotope aquaria to the contest. We accept only freshwater biotopes. How the biotope aquarium was recreated based on the natural habitat. So you should add a description (100 to 300 words), which may contain details about the underwater landscape, colour of the ground, stones and driftwood. Specify species found in the natural aquatic biotope, not used in your aquarium, but influencing the ecosystem. You can also specify hydrological and ecological characteristics of the water body, information about the threat of extinction of species. In your biotope aquarium there should be only aquatic organisms that live in this nature habitat. Please specify the actual Latin names of fishes, invertebrates and plants. Cosmopolitan and invasive species in the list are permitted only in the case of detailed explanation in the description of your biotope and (cosmopolitan / invasive species) written in brackets after the Latin name. All aquatic organisms mentioned in the list should be visible in the photos. Please specify the information sources that were used for study of your biotope. Books: title, author; article: title, author, issue or a link to an article; video: title and link; page in social networks; author or group name, a link; personal study of the biotope in nature; copy of another aquarium: information about its author. If possible, please specify more information. This will help the jury to evaluate your aquarium more accurate. High-quality photos are one of the most important components of successful participation in the contest. You are allowed to upload to your contest form up to six photos in a resolution of at least 2000 pixels by the longest side in JPEG graphical format. Each file should not exceed 10 megabytes. Blurred, fuzzy photos and photos with easily distinguishable defects are not allowed. The author can crop original photos (1) by the front glass of the aquarium (2) if there are plants above the water in it. ATTENTION! The members of the jury will evaluate only underwater part of your aquarium (3). The part above water can only affect the overall impression. The organizing committee can re-crop your photo, if your crop does not meet the specified conditions. Additional drawing and cloning parts of the photos are not allowed! If the organizing committee members or the members of the jury suspect that editing was used, the participant will be disqualified immediately. Colour and white balance correction are allowed only to compensate shortcomings of your photo. A participant can take video of his aquarium. Voice comments and other features that can reveal authorship are not allowed. Please send the link to download your video to contact@biotope-aquarium.info before the deadline. Your video will be posted on the contest channel on YouTube. Thus the members of the jury will be able to evaluate your aquarium more accurately. We accept only photos of aquaria existing at the time of submitting application. To confirm your authorship please upload to your contest form a photo of your aquarium with a sheet of paper with "Biotope Aquarium Design Contest 2016" written on it. This photo is only for the organizers of the contest and will not be published. We also ask participants to send photos of aquaria not submitted to other competitions.